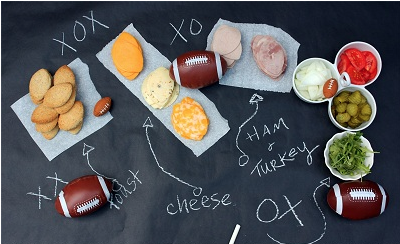 With the help of some black butcher paper and a football shaped cookie cutter, For Rent created a fun football party spread. These Super Bowl Sandwiches are as cute as they are delicious, although you will have to find another word to use other than cute when describing them to the guys. You can check out the details of this tailgate football club sandwich over at For Rent.com.